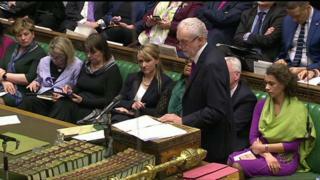 Labour's John McDonnell has said MPs who were glued to their phones during the Budget debate were "discourteous". He called on the Commons speaker to intervene after waves of MPs were seen tapping away during Philip Hammond's statement and Labour leader Jeremy Corbyn's response. Mr McDonnell urged MPs to listen to the debate - and comment afterwards. He also criticised Budget jokes at Labour's expense, saying the country needs a chancellor not a comedian. In an interview on ITV's Good Morning Britain he said: "I don't think it is appropriate, but it happens right the way across the parties... they are all tweeting away. "Actually what they are doing - and I can understand why they are doing it - they are listening to the debate and they are having their own running commentary. "My view is you concentrate on the debate - you make your comment afterwards." "I think it is something the Speaker might want to comment on because actually, I think it is discourteous," he said. Mr McDonnell also criticised Mr Hammond for using his Budget speech to make a serious of jokes aimed at the Labour leadership. Among Mr McDonnell's jokes was one where he said the Labour leader was "so far down a black hole that even Stephen Hawking has disowned him", in a reference to the scientist's criticism earlier in the week. Mr McDonnell told the BBC: "I thought it was nasty, but also to be frank, I want a chancellor in charge of our economy, not a stand-up comedian. "Yesterday was not the day, when you are inflicting suffering on people by raising National Insurance, you're not addressing the NHS crisis, you're not tackling the problems we have in social care. "It was not a day for jokes like that - it was more stand-up than it was serious economics."